Yesterday I had the pleasure of appearing as a panelist at the government’s town hall meeting in Toronto on the Trans Pacific Partnership. 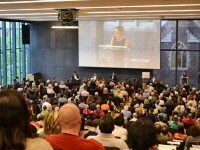 The town hall, held in a packed auditorium at the University of Toronto, featured International Trade Minister Chrystia Freeland (in listening mode) along with three panelists (myself, C. D. Howe’s Daniel Schwanen, and Unifor’s Jerry Dias) and moderator Dan Breznitz of the Munk School. It is easy to become cynical about the government’s emphasis on public consultations. They are happening everywhere – innovation, digital CanCon, TPP, and soon copyright to name a few. But to attend yesterday’s TPP town hall was to witness the remarkable passion and enthusiasm for public engagement on critical public policy issues. The event ran nearly 2 1/2 hours with dozens of speakers from an incredible range of ages, backgrounds, and interests. There were librarians and archivists focused on copyright term extension and digital locks; several doctors spoke to the impact of the TPP on public health and access to medicines, food experts highlighted the dangers associated with food security, environmental activists focused on the TPP and climate change, and speakers of all ages (including a 92 year old woman) expressed concern with the investor-state dispute resolution provisions. Some speakers quoted from Freeland’s book on plutocrats to note the inconsistency between the TPP and the Minister’s prior writing. An aboriginal student nearly broke down speaking about the need to consult first nations, bringing the room to its feet.